This page will link to article from Dubai media outlets and sometimes from other sensible newspapers or agencies. It will link to or report on any official announcements. It will not name any of the crew until their names are officially released. There will be no speculation from me on what happened. The accident was at Dubai airfield. Local laws and procedures are different. There is not the same rush of disclosure as for instance the NTSB reveals for incidents in the USA, such as Asiana at SFO or USAirways on the Hudson River. At around 12.40pm on Wednesday 3 August Emirates flight 521 crashed on landing at Dubai international at the end of a regional flight from Trivandrum (Thiruvananthapuram). Remarkably all 282 passengers and 18 crew were safely evacuated before fire burned out the fuselage. A great job by the cabin crew and airport rescue teams. Windshear was reported on all runways at the time of landing. The airframe was a thirteen year old Boeing 777-300, registration A6-EMW. The ATC recording suggests a normal approach with no priority requested or emergency declared. The first officer was making the radio calls; the captain would therefore be the pilot flying. Tower advised EK521 to on landing to vacate at taxiway M9 and cleared the aircraft to land. The crew appear to have then attempted a go-around and the tower instructed the aircraft to climb to 4000 feet. The aircraft however did not climb, but after retracting the gear touched down on the runway and slid to a rest at the end of 12L. A few seconds later tower instructs the next arrival to go around and alerts emergency services. All occupants evacuated via slides; 13 passengers received minor injuries, 10 were taken to hospitals, 3 were treated at the airport. The aircraft burned. A firefighter attending to the aircraft lost his life. Peter Lemme at www.satcom.guru has produced this detailed analysis of the ADS-B data from EK521. Worth a read. This will all be reviewed in detail as part of the investigation. His analysis is very detailed – but sensible avoids reaching conclusions. An interim report from the investigators is expected within the month. Still no mention of EK521 on the GCAA website. 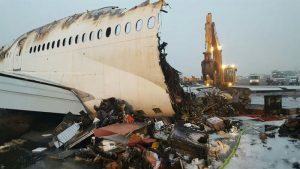 Emirates Airlines has reportedly offered $7,000 in compensation to each passenger aboard flight EK521, which caught fire after crash landing in Dubai last week. The Gulf News cited passengers as saying they had received emails from the airline on Tuesday confirming the amount, totalling about $7,000 per passenger. An Emirates spokesperson confirmed to The Gulf News that the carrier had offered passengers financial assistance to meet their immediate needs and cover lost baggage items, medical costs and other expenses. The airline also said it was refunding their tickets. Yes you did read that right: Mohammad Basheer Abdul Khadar, who was on board flight EK521 when it crash at Dubai International, had purchased his ticket on his way for a vacation with his family in Thiruvananthapuram in the south Indian state of Kerala. Khadar has lived and worked in Dubai for 37 years returning home to Kerala to spend one month a year with his family. He was one of the passengers on EK521. One week later his Dubai Duty Free lottery ticket wins him US$1million. He described his escape along with other passengers from the Emirates plane as a “miracle”. “If you ask me about my plans, I obviously want to help the children in Kerala who are less fortunate than others and need some financial help and medical support. I don’t want to give it to a charity or build a business, I want to go out and find people who really need help and give them money. I was poor, and I know what people go through,” he told Gulf News. Sounds like a good guy! Online rumours are of course not a problem if they are in the local newspapers! For reasons I do not fully understand an Australian PR company (they may be involved with EK or an EK lobbyist) has continued to heap praise on the response to the crash by Emirates and the authorities. Here are my thoughts on their bizarre involvement. They have blocked me and other friends from their twitter feed!